President-elect Donald Trump’s cabinet appointments have been horrifying. President-elect Donald Trump’s cabinet appointments have been horrifying. Scott Pruitt, a climate-science denier, as head of the Environmental Protection Agency. Steve Mnuchin, a former Goldman Sachs executive who ran a bank referred to as a “foreclosure machine,” leading the Treasury Department. Jeff Sessions, an opponent of civil rights who was once deemed too racist for a federal judgeship, as attorney general. Andrew Pudzer, a fast-food executive, as the secretary of labor. And now, Rex Tillerson, the CEO of ExxonMobil, as secretary of state. We must fight back against the racism and greed exemplified by this group. The narrowly divided Senate has confirmation power over virtually all of Trump’s cabinet. That means that if Democrats stick together, they would only have to get a few principled Republicans on their side to block Trump’s appointments. 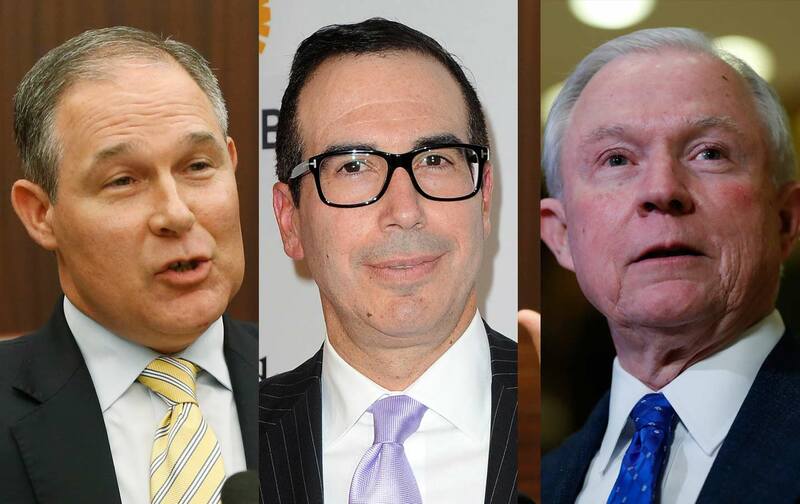 Sign the petition launched by The Nation in partnership with the Communication Workers of America, Public Citizen, PresenteAction, and many other groups calling on the Senate to reject Trump’s cabinet of hate and Wall Street greed. After you sign, you’ll be taken to a page that will help you call your Senators and increase the pressure on them to take action. The Nation has been following Trump’s cabinet appointments closely and will continue to do so as we approach the first days of his administration. Joan Walsh has pointed out that Trump’s “gilded cabinet” has made it absolutely clear that his concern for the working class is a lie. Zoë Carpenter has looked at Scott Pruitt’s history of suing the very agency he wants to now direct. Ari Berman has written about Jeff Sessions’s long history of fighting against civil rights. David Dayen has examined the role that Steve Mnuchin and Wilbur Ross, Trump’s nominee for commerce secretary, played in what Dayen calls the “Great Foreclosure Machine” of the housing crisis. Finally, Dayen also looked at the Securities and Exchange Commission’s investigation of Tillerson’s ExxonMobil for failing to accurately price its oil reserves.